The Netherlands is starting research into the Indonesian independence war. Many voices not in support of this are coming out of the woodwork. Many historians are afraid that the Dutch will change Indonesian historiography. According to Dutch historians, the research project, titled “Decolonization, Violence, and the war in Indonesia, 1945-1950”, will focus on different parts of Indonesia. Incidents on Sumatra, Java, Kalimantan, Sulawesi, and Bali, will be researched in more detail. “The final selection isn’t written in stone, but these are the areas that we have tentatively chosen” says project coordinator, Ireen Hoogenboom on Wednesday, September 20, 2017. Three Dutch organizations will carry out the research: KITLV, NIOD, and NIMH. They say they’ll work together with Indonesian researchers, but not with the government. “It’s not a research project between two governments, but it only takes place on an academic level,” according to Ireen. For this project, which will cost 4.1 million euro, the Dutch team will work together with researchers from the Gadjah Mada University (UGM). They can select their own researchers. “There will be one researcher appointed for each area. UGM will lead the dialogue between Dutch and Indonesian researchers; on the Dutch side, we won’t interfere with that. They will coordinate their own researchers to write their research report in a separate scientific publication,” explains Ireen. 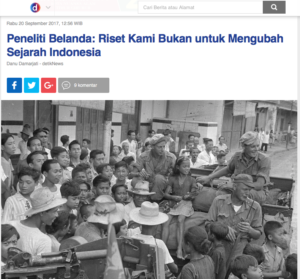 The research, which will include the atrocities of the Bersiap period right after the Japanese occupation, claims to be independent, even though the three institutions will be financed by the Dutch government. The independence of the research will be validated by a scientific advisory board. Reactions from society will also be taken into account. The results of this scientific research project won’t be used to justify Dutch attitudes to Indonesia in the past nor are they meant to support the current political stance of the Dutch government. As is well-known, the Dutch presence in the archipelago was a colonial occupation from which Indonesia liberated itself. During the initial euphoria in 1945 and 1946, right after the declaration of independence, many atrocities took place. “The goal of this research is to investigate (as much as possible) what happened, and why, not to whitewash over any dark events or to take a political standpoint,” according to Ireen. Marjolein van Pagee, another Dutch researcher (as well as founder of the Histori Bersama Foundation) had previously pointed out the lack of Indonesian participants in the study. She wondered why the Comité Nederlandse Ereschulden (K.U.K.B.) wasn’t included and she suspects that it’s related to the lawsuits that the K.U.K.B. filed against the Dutch government—the government that is now funding the research. In these lawsuits the Dutch state was forced to pay compensation for its occupation of Indonesia. “This historical research claims to be independent. Yet, K.U.K.B. is not involved in the research even though there is clearly a relation between the research project, ‘Witnesses and Contemporaries’ and K.U.K.B. ; both take data from Indonesian witnesses,” she explains. The project “Witnesses and Contemporaries” is a part of the large research and focuses on gathering stories of those who experienced the decolonization war. Researchers invite them to share their war experiences.